A bit of a digression today. 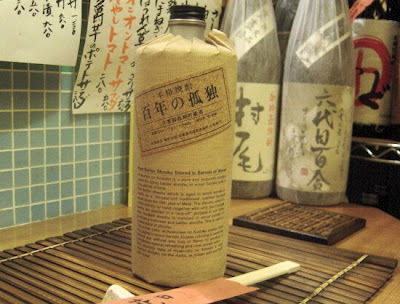 The wonderfully named "Hyakunen no Kodoku" ("One Hundred Years of Solitude") is not a whisky but a shochu. It is however a cousin of our whiskies. Shochu is Japan's indigenous distilled spirit, made from all sorts of ingredients and not to be confused with sake. I don't want to weigh this site down with too much shochu talk so I have created a little side blog to give a few more technical details. Many shochus have no more in common with whisky than I do with the Pope, but there are shochus that are pretty close relatives. 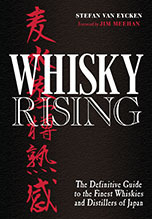 A lot closer in fact than the Indian molasses based "whiskies" about which The Scotch Blog has written incisively. Hyakunen no Kodoku is a pure and exquisite shochu made by aging barley shochu in wood barrels over a long period of time. The barley shochu which is aged in wood barrels is made by a 100-year-old traditional method handed down since the 18th year of Meiji. The shochu, which is made entirely by hand, together with only the choicest barley are distilled in a "one-off" process in pot stills. The resultant shochu is matured in wood barrels to produce a mellower and tastier shochu. This is really a masterpiece of shochu. The amber color of Hyakunen no Kodoku come from long aging in wood barrels. Excess coloring is carefully filtered out without any loss in flavor to produce a completly natural, refreshing and clear amber color. The exquisite taste of Hyakunen no Kodoko is best enjoyed straight, on the rocks, or mixed half and half with water." From which we can conclude that it is chill filtered, or some such process. The actual age of the spirit is not made clear. It is certainly not 100 years old. That is the age of the shochu making method (actually, it is now 121 years old). I think the aging is a relatively new innovation. Labeling of such things in the shochu world is sometimes obscure. Anyway, I am still saving up up my pennies to have my own taste (it costs 14,000 yen a bottle, about 70 pounds). I have to I admit I am sceptical of the whisky comparisons. I have heard them before and, in my very limited experience, barley shochu is quite different. It is a much more mellow and almost sakeish drink. After a taste of solitude, I can move on a potato based shochu aged for ten years in sherry casks. Interesting report. Soju, the Korean equivalent of shochu, is extremely popular in Los Angeles. It started out as a Korean nightclub drink and has become a neutral spirit of choice for mixed drinks. It appears that, because of the low alcohol content, restaurants that have a limited liquor license can still serve soju. I think there is quite a lot of Soju sold in Japan nowadays. 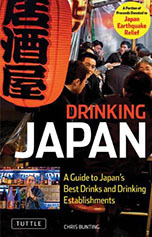 I think it generally comes under the korui category I talk about in my side blog on shochu. The Japanese korui shochus are similarly neutral but people tell me not as sweet in general as the soju. Is there a good brand of Soju I can try? Honkaku shochus, of which Solitude is one, are a bit different. They are not neutral in taste or smell, and are often marketed a bit like single malt whisky from the individual distillery rather than in branded bottles. I'm not really a fan of the sojus I've had (more of the neutral spirit type than what you're talking about, I gather), but the one I've heard the most good things about is Jinro Chamjinisulro, which is filtered through bamboo charcoal. Is this the one? This looks like a good Soju review page. That's it...sort of a Lincoln County process for soju. You definitely should try hyakunen no kodoku. I was lucky enough to have a taste once when i was in an ikebukuro izakaya. It was simply amazing, very easy on the pallate and with many many distinct layers of flavour coming out one after the other. Lucky for me I used to live close to where it is distilled, so I could get it cheaper than the prices you give in your article, though I have heard it may be even MORE expensive in Tokyo. I am now on my 5th bottle in as many years. It is absolutely beautiful. I compare it to the smoothest whiskey you have ever drunk. How much is the bottle?